Evil Dead News - News Related To The Evil Dead Franchise: SDCC: Ash vs Evil Dead Panel, Autograph Info and More! 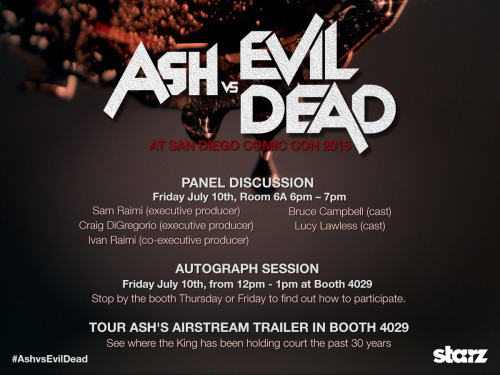 SDCC: Ash vs Evil Dead Panel, Autograph Info and More! The panel takes place on July 10th in room 6A from 6 pm - 7 pm. An added bonus is being able to tour Ash's Airstream Trailer in Booth 4029.